Guitar Tricks really began the online guitar lessons that fill the internet today. They started their journey in 1998 and constantly grown to be a comprehensive website and one stop solution for beginners, intermediate and expert guitar players. They have extended their knowledge and teaching to anyone who wants to learn guitar or brush up on their skills. You can even try their Android and iOS apps to learn guitars. So I signed up last month to try out there program to tell you what’s what. Guitar lessons and guitar tricks were never this easy to start learning before. Guitar tricks by far have been proved as the best and easy resource for anyone to learn playing. Today, in our Guitar Tricks review we will see how it actually in competition to other YouTube and established teaching resources. One nice factor is that before you get started they take some time to get to know your level as a guitarist. Asking you how confident you feel about your skills in certain areas, and which style of guitar you are most interested in learning. There were roughly 12 questions and very simple. Gave me the feeling they actually wanted to show me the most relevant and useful information for my growth. 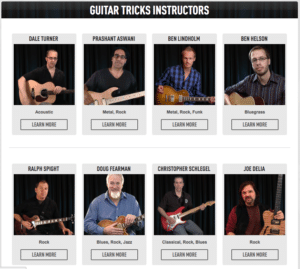 Since its inception, Guitar Tricks has kept on adding lesson plans, songs, videos to create a vast library of resources for beginner to guitar expert. It has collected over 11,000 lessons and more than 600 songs which are available 24/7. From the home page is the option to follow through their “Core Learning System” which goes over everything from the fundamentals and then into specific genres. The core learning system is great for beginners while seasoned players can develop their skills further with the lessons. There are quizzes and practice songs to play with which contain hits from Beatles, Floyd, Led Zeppelin, Grateful Dead, Van Halen and many others. For beginners, the “Guitar Fundamentals 1” is your first step to learning guitar basics. It is a step by step guide on how to play the guitar and everything else that’s associated with guitar playing–how to hold a pick, how to strum, how to play simple chords, and so on. You can even have song lessons arranged according to your skill level. As for those with a little bit of experience, the “Guitar Fundamentals 2” will take your guitar learning experience to the next level. Video lessons are also available for each course in the Core Learning System. Each video guitar lesson is dedicated to a specific style of playing: Blues, Rock, Country, etc. You may need to to take out your electric guitar or acoustic guitar depending on the course you are learning. Many reviews miss out one of the most important aspects of online guitar lessons is their ease of use. The truth is, it’s tough for beginners to know what to do once they sign up for a guitar teaching plan. Good thing the interface of Guitar Tricks is simple enough for first timers to navigate and access step by step instructions. The menus and options are straightforward and teach you everything from basic chords, fingerpicking, fingerstyle, picking, rhythm, slide, strumming and everything else a beginner needs to learn. You can progress slowly to improve your skills and learn the next step. The videos also play fast and you can loop them for better learning. You also get several angles to pick out hand movements accurately. 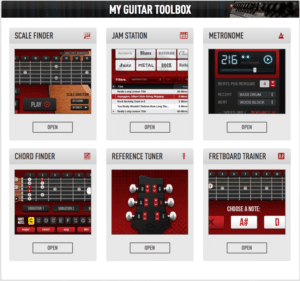 I really enjoyed their “toolbox” section that included a great jam sessions tool that put down a simple background track for you to practice your lead guitar against it. Learning to play guitar has never been this fun! Though Guitar Tricks contains the most practice songs in the industry, they are still slow in adding new songs. You have to manually cancel the 14-day trial by going to your membership page. It is an easy and simple process. It may be a bit confusing for a beginner if he begins to explore all the options and lessons all at once. It is advisable to proceed through the step by step learning program. The site also has a vast and active forum with questions and discussions going on everything from music theory to technical advice and song-writing and music production tips. Sure, you can get some free lessons on Youtube. In fact, you can learn to play the guitar through different online lessons other than those on Youtube. But really, nothing beats the online lessons on Guitar Tricks. While those free lessons all over the internet are helpful, most of them are not exactly tailored to fit everyone’s level of expertise. That said, they tend to appeal more to experienced guitar players than the beginners which is ironic considering that the latter needs more of the help they can get. If you really are determined to learn how to play the guitar on a more professional level, then it certainly pays off to spend some quality time and extra cash on formal guitar lessons. If you ask me, Guitar Tricks is quite a good place to start honing your skills in guitar playing. It is a good investment of both your time and money. If you’re a little apprehensive, there is always the 14-day Free Trial. Here is a free video they offer you can watch to get a better idea of the tutorial videos. This particular one is an artist study on how to play like Eddie Van Halen.